Braces can correct crooked and crowded teeth, a misaligned bite, and jaw problems. 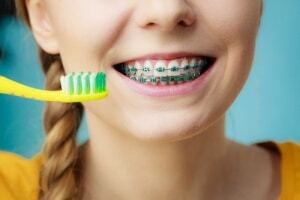 Braces also eliminate problems you may have with eating, speaking properly, or with keeping your teeth clean. With advancements in dental technology, traditional braces are now sleeker, smaller, and more comfortable. Traditional braces consist of standard metal brackets that are placed on your teeth with an adhesive and connected by wire. Even though alternative treatments such as veneers, crowns, and clear aligners exist to straighten teeth, traditional braces are still the gold standard. We provide braces for both adolescents and adults! If you’re ready to get started with braces and straightening your smile, then request a consultation today! Our doctors are pleased to bring Invisalign™ invisible aligners to our patients. These innovative orthodontics will straighten teeth in as short a time as 9–15 months! They correct all the problems traditional braces do – crossbite, underbite, and overbite, as well as gaps and crooked and overlapping teeth. With the aid of 3-D computer technology, we are able to outline an entire treatment plan, starting with the current position of your teeth and progressing to your gorgeous new smile. Using this plan, sets of clear thermoplastic aligners are made. They fit over your teeth, and beginning with the first set, they begin to gently move your teeth into the desired position. Every two weeks, you advance to the next set until you achieve your new smile. Total treatment time varies based on individual needs. Evaluations are minimal, and the requirement for check-ups is only every one to two months. 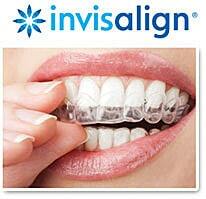 The Invisalign system has advantages over wearing traditional braces. As the name suggests, they are nearly invisible – someone would have to look extremely closely at your teeth to notice them. This keeps your confidence during active treatment. As the aligners are one piece each for the top and bottom teeth, they are very comfortable to wear. There is no tightening or adjusting of wires, no metal braces attached to teeth, and never any headgear. A huge plus is that you can eat whatever you like throughout your treatment time. Wear the aligners all day and during sleep, but you can remove them while eating or brushing and flossing. This lets you have the foods you like but also lets you keep your teeth very clean and healthy. Are your ready for the smile of your dreams? We can schedule a consultation to find out if you’re a candidate for braces or clear aligners. Call (614) 771-6060 now.